North Korea Threatens 'Ultimate Measures' Over New U.N. Sanctions : The Two-Way North Korea is blaming the United States and threatening "something thousands of times worse" in response to a package of sanctions that the U.N. Security Council passed unanimously over the weekend. 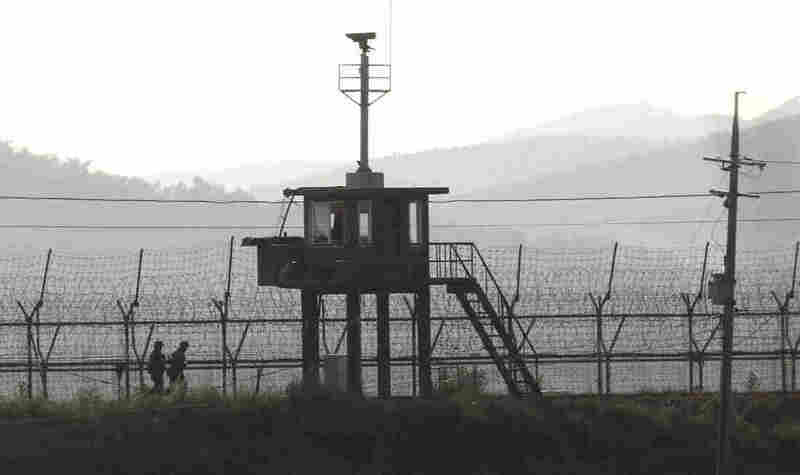 South Korean army soldiers patrol on Monday along the barbed-wire fence in Paju, near the border with North Korea. As global pressure ratchets up against North Korea with a new package of sanctions, the rogue nation is blaming the United States and threatening "ultimate measures" in response. The U.N. Security Council unanimously approved the new sanctions over the weekend, which are aimed at cutting roughly a third of North Korea's annual export revenue. Nikki Haley, the U.S. ambassador to the U.N., called the package the most stringent in a generation. It was introduced in response to North Korea's two intercontinental ballistic missile tests last month. North Korea has responded to the sanctions with characteristically strong rhetoric. "We will balance the U.S.'s felonious crime against our country and our people with something thousands of times worse, and if the U.S. does not retract its attempts to crush us to death and behave prudently, we will be ready and not hesitate to take ultimate measures," the government said in a statement published by the state-run KCNA news agency. "We've not had an extended period of time where they have not taken some type of provocative action by launching ballistic missiles. So I think that would be the first and strongest signal they could send to us, is to just stop these missile launches. Obviously we have other means of communication open to them, to certainly hear from them if they have a desire to want to talk." President Trump and South Korean President Moon Jae-in had an hourlong phone call on Sunday evening, as NPR's Elise Hu reports, adding that Moon "reiterated on the call that there cannot be another war on the Korean Peninsula and called for a peaceful diplomatic resolution to the issue." According to the White House, "the two leaders affirmed that North Korea poses a grave and growing direct threat to the United States, South Korea, and Japan, as well as to most countries around the world." North Korea's top diplomat is also participating in the security forum in Manila, and had a rare meeting with the South Korean foreign minister on the sidelines of the forum, according to South Korea's foreign ministry. "South Korean media report the two shook hands and spoke only briefly," Elise reports. "China, which is Pyongyang's closest ally, said the North did not entirely reject proposals by the South to engage in talks." It's particularly notable that China voted to back the U.N.'s sanctions package. But Elise adds that there's a bigger question here: Will the sanctions even be effective? "Will it get North Korea to come back to the table and change its position on its nuclear development? A lot of observers in this region doubt it, because North Korea pins its very survival, its domestic legitimacy on its deterrence capabilities. So a decade of sanctions we've seen now, they really haven't yielded the intended result of getting North Korea to the table. Instead it's kind of the opposite — North Korea has been improving its capabilities." Robert Daly, China specialist at the Woodrow Wilson Center, tells NPR that China wants to be "seen as a responsible global leader," and "the fact that China is taking a public leadership vis-a-vis North Korea, that's an important change." China shares a more than 800-mile border with North Korea, and Daly adds that during previous sanctions regimes, "China either wouldn't or couldn't enforce them fully."